Ben Ecclestone grew up surrounded by paintings and ceramics. This atmosphere had a quiet but profound influence on his interests and at the age of 15 he began studies at the Canterbury College of Art, England. He married in 1957, the year he left college, and began two years National Service in the British Army. Immediately following his army service he joined the staff of British Youth for Christ. During the 10 years he worked with BYFC he occupied a variety of positions including evangelistic work, illustrating and eventually editing the YFC magazine VISTA. He was finally appointed Assistant National Director. Since leaving YFC in 1970 Ben has worked as a Graphic Designer in a print and design company and for the last 24 years as a self-employed designer and, more latterly, 15 years as a painter, illustrator and Adult Art Teacher. During this time he became a member of the Arts Centre Group and served as a member and eventually Chairman of the Board. He remains a member and was influential in commencing the first ACG Regional Group in East Sussex which still meets after more than twenty years. Ben has illustrated a number of books written by author Adrian Plass and instigated two joint publication projects, Words from the Cross and Urban Angel with Adrian Plass and poets Stewart Henderson and Penelope Wilcock. Ben is a member of several Exhibiting groups in his home town of Eastbourne and regularly exhibits in the area and further a-field. In 2009 Ben, in association with two friends, founded Catalyst Arts, an Eastbourne-based arts organisation dedicated to promoting and teaching the arts from a Christian worldview while ‘walking the shoreline’ between the Christian and main stream culture. The teaching of Dr Francis Schaeffer and Professor Hans Rookmaaker was a significant factor in Ben’s eventual commitment to the arts as an expression of his Christian faith. Ben’s work is somewhat unusual in that it is carried-out in gouache and pastel on constantly wet paper or with acrylic and pastel on wet canvas. This enables the paint and pastel to blend together as one medium and at the same time preserve the distinct drawing characteristics of soft pastel. A certain amount of the work is done with a large brush but mostly using a domestic sponge to apply and blend both paint and pastel. This approach is a combination of ‘painting/drawing’, a term used by American artist Ron Kitaj to describe his own work. Ben’s personal preference is for gouache and pastel as this allows the painting to be regenerated by immersing in water for a brief time after being allowed to dry thoroughly. Work on the painting can then continue. In this way the painting can be worked on in a wet and fluid state for as long as necessary. The working process almost always begins with a sketchbook drawing from which the final painting is made. Drawing is from life, where possible, otherwise from a paused video recording. Working from the sketchbook drawing, much as in the same way as French artist Pierre Bonnard, gives freedom to choose colour schemes and approaches which are not dictated by the physical presence of a model or subject. The principal theme of Ben’s work has, for several years, been the human figure in motion. Where it is possible to make studies from life this is a bonus but this is often difficult as many images have their source in contemporary dance, gymnastics, athletics or ice skating. Video recordings then become a primary source of visual imagery. To avoid making a direct illustration of a particular activity the figure is usually removed from its accepted context and set within a very shallow space. The image will go through various permutations, often overlaid by a slightly different physical position or as part of a dissolving multi-image sequence as in the film medium. There is a special beauty in human movement, even when in moments of extremes. Beauty has for sometime been off-limits in the visual arts, but it is Ben’s objective to produce images which combine dynamism and grace without redress to sentimentality or prettiness. The original inspiration always comes first from a visual experience. No specific meaning or interpretation is imposed on a painting, apart from a suggested title. This often allows a sense of celebration or exhilaration to be enjoyed directly from the painted image. In this way the viewer is enabled to sense what it might be like to move in this way and so enter more fully into the full-orbed experience of man made in the image of God. Two comments left after a show of Ben’s work in Birmingham titled ‘Join the Dance’ are examples of this. ‘ From a dancer: I think they are so amazing! Thank you so much. He really is a moving God’. Catching the Light, gouache & pastel on paper. Image size, 50cm x 50cm. Nuba Rope Dancer, gouache & pastel on paper. Image size, 63.5cm x 48.5cm. Rolling Spheres, gouache & pastel on paper. 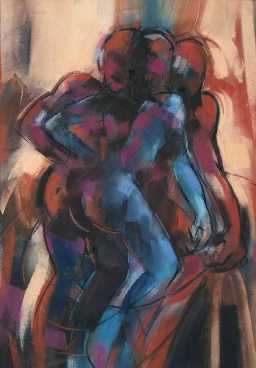 Image size, 48cm x 63.5cm. Slow Dissolve, acrylic & pastel on canvas. Image size, 74cm 85cm. Twister, gouache & pastel on paper. Image size, 53cm x 73cm. A limited number of Urban Angelavailable from Ben Ecclestone (poems about the city and the people who live there) by Stewart Henderson and Penelope Wilcock with collages and illustrations by Ben Ecclestone. Hardback. Price £10.00 plus package and postage.